Every summer, as the temperatures rise outside, so does the thermostat inside. While you get up and go to your job every day – which hopefully is air conditioned! – your four-legged friend stays home. With the heat also comes the potential for heat-related illnesses and even heat stroke. Here are a few tips to keep your pet cool when you’re away from home. To AC or not to AC? It’s true that dogs roamed wild for centuries if not millennia before being widely domesticated and adopted as man’s best friend, but that doesn’t mean that they will be fine left in your home all day. For the average summer day, temperatures won’t rise to unbearable levels in most areas of the country, but excessive heating waves can lead to downright sweltering temperatures that may put your home in the danger zone. For days when temps are forecast to be above 90 degrees F, consider keeping the air conditioner on at least a low setting while you’re out on to at least take the edge off the excessive heat. Fans are among the top options for keeping an indoor dog cool while indoors. Fans provide a constant movement of air, which helps to keep cooling air blowing throughout the home. Dogs typically pant and sweat through their paws as primary means of cooling down, and having fresh air – especially dry air, as humidity can limit the effectiveness of panting and sweating – blowing through your home can help relieve heat. 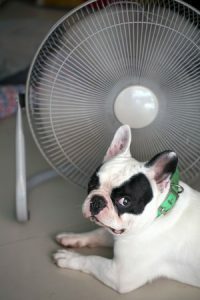 If you have a basement or cellar, positioning a fan to blow cool air up into your home – or even letting your dog spend time there, if possible – can help beat the heat. Throwing a few of your dog’s favorite toys in the freezer overnight can help provide a refreshingly chilled plaything to help stay cool for part of the day. A frozen toy will thaw as the day goes on, but your pup will enjoy the cold on a hot summer day. You can also freeze water bottles and leave them near your pet’s favorite lounging areas to help create an icy place to rest. Wrapping them in towels will prevent condensation from saturating through and help keep them frozen for longer. One last aid for keeping the home more comfortable for both you and your friend is using thermal, sun-blocking curtains in your windows. These thicker fabrics help prevent the heating rays of the sun from getting through and baking your home, reducing the impact of the sweltering summer sunshine. This will also keep your home nice and shady, as well, which will provide more cool spots for your dog to lie down and lounge through the summer days. The Humane Society offers some additional tips for ensuring your pets stay cool while you’re away. No matter your methods, make sure to keep your four-legged friends comfortable so you can beat the heat of the dog days of summer together.